This month it is mainly a case of continued progress on several fronts. 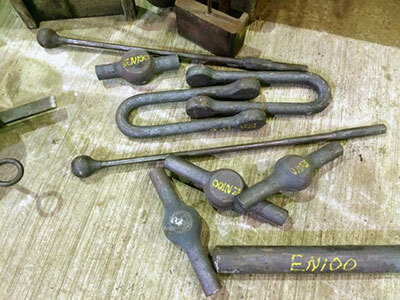 Sub contract machining of various fittings continues, as does preparatory work towards the fitting of expansion link brackets to the motion brackets and the shaping of some vacuum and train heating pipework under the bunker area. The framework for the crew seats has been made. The smokebox door has been on one of the vertical boring machines for a light machining of the edge which closes on to the front ring of the smokebox. On GWR, LMS and BR Standard locomotives this is a metal to metal air tight joint so a good surface finish is essential. The manganese liner plates for the horn guides have been surface ground to ensure they are flat prior to fitting. 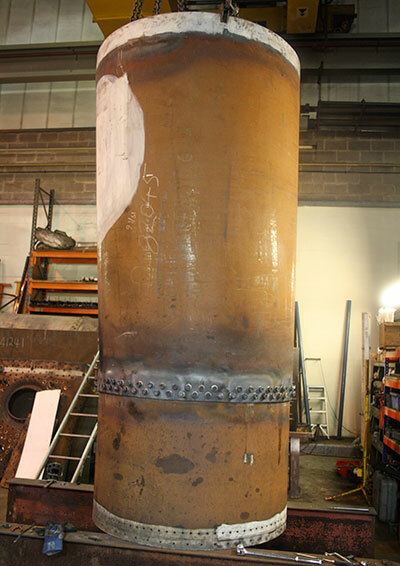 The two boiler barrel sections are now bolted up ready for riveting. Stephenson Engineering are making the two drawhooks and screw couplings. 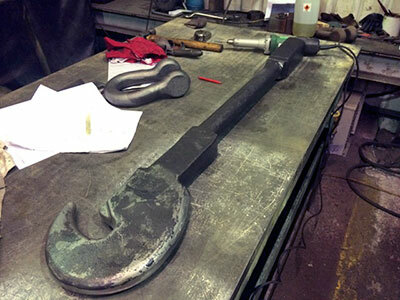 They have also provided the bearings for the connecting rods which they machined a little while ago. The bearings are not yet machined. Steam Paradise - or the nearest we can get to it in 2016! This autumn's BR Standard Locomotive Owners' Group (BRSLOG) meeting was hosted by LNWR Heritage Ltd at Crewe on 19th November. We were given a pre-meeting tour of the extensive Jeremy Hosking facilities and were most impressed with the superb set-up: a huge amount of investment has gone into converting what had been a semi-derelict diesel depot into the nearest thing to a steam locomotive works I have seen since the 1960's (but a lot cleaner and tidier!). Among the locos on view were Britannia, Bittern, Clan Line and Blue Peter, together with a selection of coaches in various stages of restoration to a superb finish. In view of Crewe's distinguished railway history, it is very pleasing that the town should have such a splendid steam works. For those of us who have dreamed about the possible series building of 82XXX tanks, seeing what has so quickly been achieved there made us realise that a facility of this calibre would be a dream come true. I have thought for a long time that the steam preservation industry could just do with a central works of this kind: it is difficult to see how the financing and staffing of such a collective enterprise might be achieved, but if anyone has any bright ideas, please feel free to kick them around on any suitable forum (not the 82045 website, I should add!). Above all, never say never. Thanks to LNWR Heritage for making the visit possible, and especially to Peter Greenwood for giving us a most interesting tour. Our new 2017 calendar is available and may be purchased from Barbara at a cost of £6.00 + £1.25 p&p. 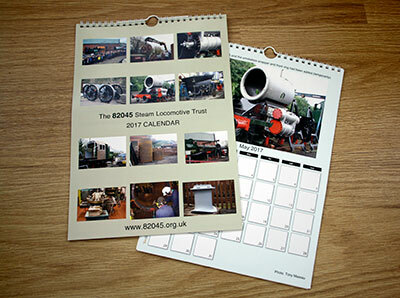 The new look calendar is in full colour and pictures various stages of 82045's construction. Please remember to send your name and address with cheques please! 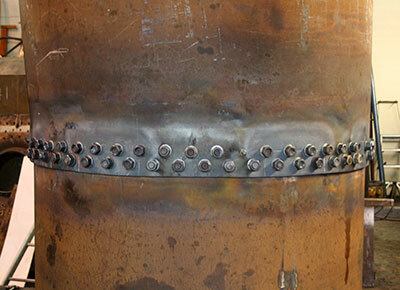 The boiler sections bolted together prior to riveting. Photo: Tony Massau. The bolted joint of the two boiler sections. Photo: Tony Massau. One of the two drawhooks. Photo: R.Stephenson.